one has to learn that IT PAYS TO WAIT FOR A GOOD SETUP. 11/9/2007 12:23:16 PM Mountain TG:: Out for +8. did exactly what my system said to do and it worked out well. that is a nice feeling. 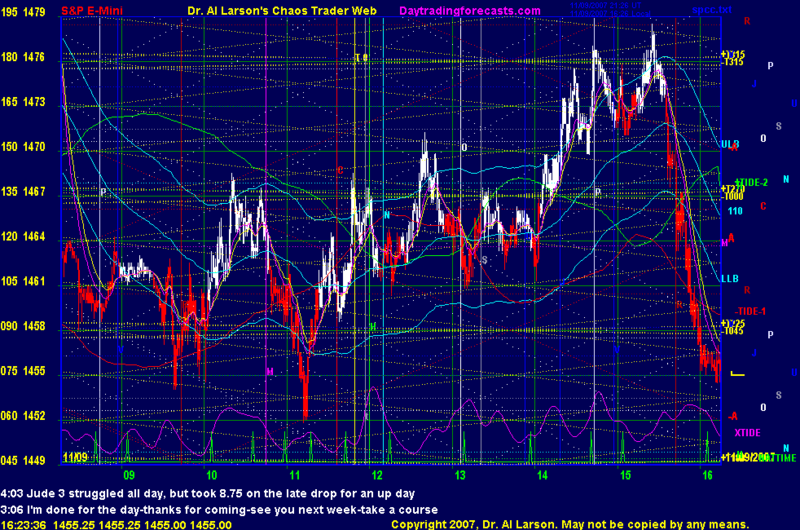 I do think there is a move 6 and 7 to come and was very tempted to just hold on to end of day for potential big upside. I'll take the 8 now and hope for a good entry on a move 7 up. 11/9/2007 12:18:47 PM Mountain TG:: I've been long from 65.25, I've found on these high volatility days (I've defined them as making moves that go twice Al's 4 point band from 110 exma, hence moving to 8 pts from 110), that a 4.25 point stop is about right until trade gets going. On these sort of days I don't like getting whipped out of a good entry because my stop was a little too small. Too offset the extra loss potential of the larger stop I move the profit target from 5 to 8. Works pretty well. 11/9/2007 12:17:56 PM Mountain DBJ:: Bought 69. Up 27 points would be very welcome! 11/9/2007 12:06:58 PM Mountain TG:: wow, bottomed near 2:00 1 tick from my stop. Was using 6hr FOP sized to 28 pts with 10:00 low the pivot starting point. bottom of 2:00 wick was just outside of llc. 11/9/2007 10:31:10 AM Mountain DBJ:: Rebought 63. 11/9/2007 9:38:05 AM Mountain KWS:: does that mean natal Sun of NYSE? 11/9/2007 8:53:21 AM Mountain KWS:: in which course is taught the Mercury timeline?